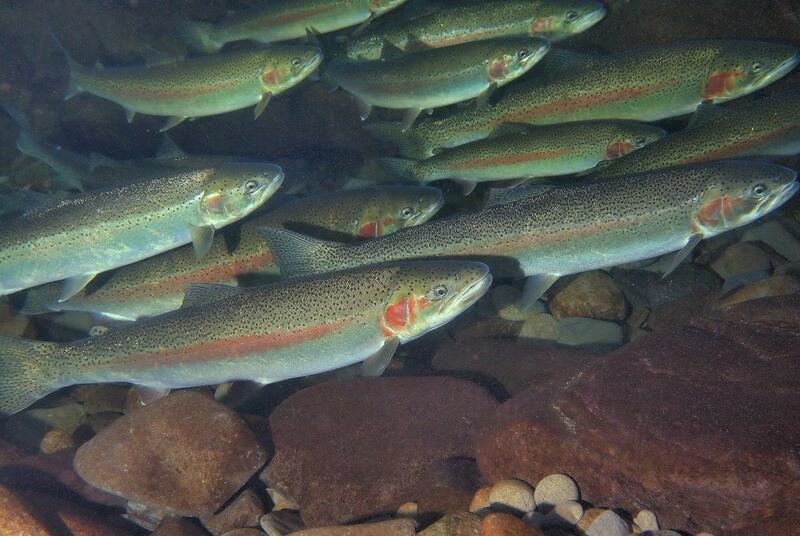 Steelhead trout that spawn multiple times have more than twice the lifetime reproductive success of single spawning trout, suggesting there is a substantial benefit associated with repeat spawning. But it comes with a tradeoff, according to new research published in Proceedings of the National Academy of Sciences. Repeat spawners make the dangerous journey from the ocean to their freshwater spawning grounds multiple times throughout their lives, while single spawners take the risk only once. The findings show that single spawning fish are more successful than first-time repeat spawners their age, pointing to a tradeoff between mortality and reproduction. Single spawners die after reproduction, so they give everything they have to their one batch of eggs. Repeat spawning fish, on the other hand, save some of their energy for later. "They're holding back a little bit the first time they spawn, and when they come back a second time, they do better than the fish that only spawn once," said Mark Christie, an assistant professor of biological sciences at Purdue University. "There's a tradeoff between saving energy to successfully survive the additional migration event and putting all of their eggs in one basket." Despite the clear reproductive benefits associated with repeat spawning, only 2.4 percent of fish in the study were identified as repeat spawners, suggesting that multiple journeys out to sea and back are seriously risky. The study also found a fitness tradeoff at age of spawning for single spawners. As expected, older, larger males had greater reproductive success than younger, smaller males. "There's a tradeoff associated with waiting out at sea. The risk for mortality increases the longer a fish spends out there, so the expectation is that the longer they spend at sea, the higher the payoff will be to offset those costs. They'll come back to their spawning grounds bigger and stronger," Christie said. "And that's definitely what we see in male fish." Females, on the other hand, had the highest reproductive success at age 3, despite being smaller than 4- and 5-year-old fish. This phenomenon is explained by negative frequency dependence: the idea that the rarer a particular life history strategy used by a species is, the higher its fitness will be. "Negative frequency dependence is the idea that selection favors the rarest life history strategies," said Michael Blouin, a professor of integrative biology at Oregon State University. "In this study, we show that the older, larger female fish have higher reproductive success when they are less common, perhaps due to decreased competition." Negative frequency dependence and fitness tradeoffs explain how steelhead maintain their incredibly diverse life history strategies. In fitness tradeoffs, the costs and benefits associated with each trait prevent any one from becoming permanent. Negative frequency dependence does the same thing by making the most common strategies the least beneficial for the organism. Researchers examined these traits in a nearly complete 16-year pedigree of more than 12,000 winter-run steelhead (Oncorhynchus mykiss) from the Hood River in Oregon. They used game theory, mathematical and computer models to show that one life history strategy would dominate in the absence of negative frequency dependence. Models also showed that coexistence of the two strategies is possible, but there's a tradeoff between mortality and fertility. "If the mortality associated with going out to sea is too high, the repeat spawning strategy would never evolve. But if it's low enough, and if there's a fitness benefit, which we've shown there is, these two life history strategies can coexist," Christie said. "There have to be intermediate levels of mortality for both types of fish to exist in the population." Understanding how a species maintains life history variation could lead to more effective conservation efforts. The study suggests that restricting the harvest of older, larger females when their numbers are down may facilitate negative frequency dependent processes. Using these mechanisms to maintain diversity could reverse declining populations. Christie collaborated with Gordon McNickle of Purdue, Rod French of the Oregon Department of Fish and Wildlife, and Michael Blouin of Oregon State University. The research was funded by Purdue and the Bonneville Power Administration.